The khanate was a splinter state of the disintegrating Golden Horde. It occupied the former territory of the Volga Bulgars, and was neighboured by the Astrakhan khanate to its south-west, along the Volga shoreline on both banks and hugging the north-western coast of the Caspian Sea. The khanate's rulers were credited with being directly descended from Urus Khan of the White Horde (1374-1376). The founder, Ulugh Muhammad, had for many years contended against various opponents for control of the disintegrating Golden Horde. He seized power in 1419, but was captured and imprisoned in 1422 and held for two years by his rival, Dawlat Berdi. In 1430, still fighting Dawlat for control of the horde, he attacked the Crimea, but was defeated. A further attempt at gaining power saw him successfully reclaim control over the Golden Horde in 1427, but again he was continually challenged by rivals. In 1437 he lost control for the final time and headed east to capture Kazan, where he formed his own independent khanate out of previously Golden Horde territory. Former khan of the Golden Horde. Founder of the khanate. The Shaibanids carry out a number of raids into the khanate from their empire in Transoxiana, but their ruler, Mohammed Shaibani, is killed on one of them in 1510, bringing the prominence of his short-lived empire to an end. First rule. Khan of Qasimov. Driven off. Shah Alî is driven out by Sahib Giray I of the Crimean khanate due to the former's friendly relations with Moscow. Kazan's territory is incorporated back into that of the Crimea under the rule of Khan Muhammad Giray, father of Sahib Giray. Aq Köbek is responsible for deposing and killing Khan Qasim II of Astrakhan, and ending his long reign (Qasim's son, Yadigar Muhammad briefly rules as the last khan of the Kazan in 1552). 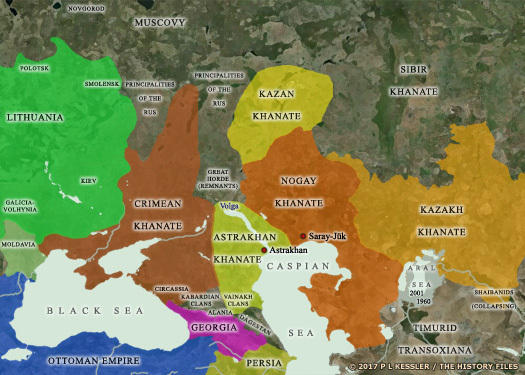 However, during his own time as khan Aq Köbek apparently puts in place a treaty or agreement that, for the time being, guarantees the independence of Astrakhan from the Crimean khanate and the Nogais. Son of Muhammad Giray I of Crimea. Khan of Crimea (1532). Son of Khan Qasim II of Astrakhan. 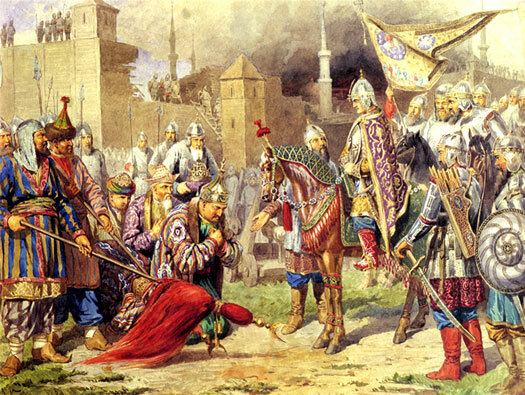 The khans of Kazan are conquered by the Russians under Ivan IV.